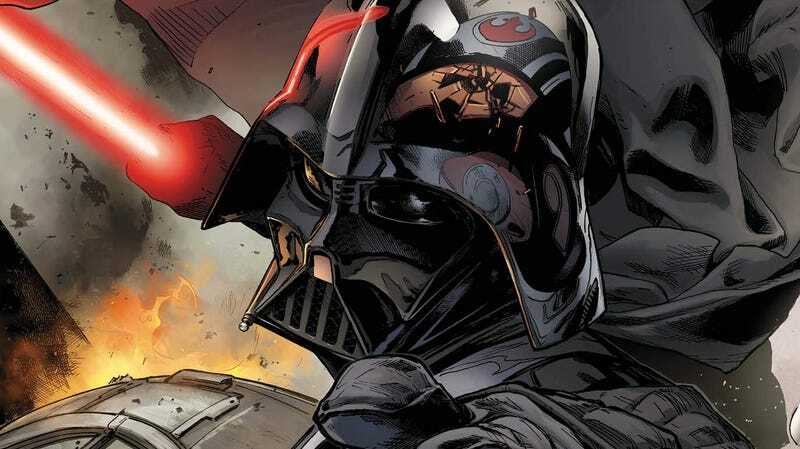 Star Wars canon has changed, and some of that has happened in a new wave of Marvel Comics series. Months ago, we saw Luke Skywalker wield a lightsaber against his father way before their fateful meeting in The Empire Strikes Back. This week’s Star Wars comic has them dogfighting against each other and it’s damn great. The first installment of a crossover between the Star Wars and Darth Vader series, Vader Down #1 launches a climax that’s the culmination of the first year’s worth of storylines in each title. Written by Jason Aaron, with art by Mike Deodato, Frank Martin, Jr., and Joe Caramagna, the first issue finds Vader following information—gained by torture and backchannel deals—that places Luke Skywalker at a remote planet called Vrogas Vas. The near-barren sphere was once home to a Jedi temple but it’s also a refueling base for the Rebel fleet. ...for the Rebels, that is. The spaceship battle sequence that follows is the first of many great moments in Vader Down #1, followed by another great scene where Luke and his dad aim their ships at each other at full speed. They both survive, though, and seem headed towards another pivotal new-canon encounter. and barely survive an encounter with Boba Fett. The Lord of the Sith learning that Luke was his son was another highlight, one that established that Vader had an even stronger reason for finding the pilot that destroyed the Death Star. After reading Vader Down #1, it’s clear that father and son have been on a collision course ever since their last meeting, though it hasn’t seemed that way in the separate series. In Star Wars, Luke’s been on a hunt for Jedi knowledge, using Obi-Wan’s journal to guide him and getting captured by a Hutt who obsessively collects Force-wielder artifacts. Meanwhile, in Vader’s title, the newest storylines have had him backed into a corner by machinations to pursue an agenda away from the Emperor’s awareness. This has been an embattled Vader, barely dodging a new cohort’s master-detective efforts to root out the source of a high-stakes heist Vader himself put together. It’s been a tense workplace drama that’s shown Vader as increasingly vulnerable. So, it’s great that Vader Down #1 serves as a reminder that Vader is one of the most formidable warriors to ever exist in the Star Wars universe. Scenes where he takes out Rebel ships from the ground feel like they could be moments from the new Battlefront game and his arrogance in the face of overwhelming odds feels well-earned. Luke, on the other hand, still has lots to learn and the Vader Down storyline might be where he gets some more painfully won knowledge. Star Wars’ new future is only a month away in the form of The Force Awakens movie. But, the past of Star Wars continues to change in fun ways, too, which makes this crossover worth paying attention to.